TP6860-14MGT-55 PowerGrip GT2 Twin Power belt. 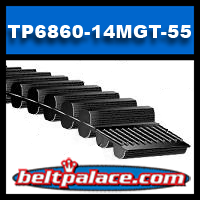 Features: Belt capacity is equal to standard single-sided PowerGrip GT2 belts. - Fiberglass tensile cord provides high strength, excellent flex life, and high resistance to elongation. - Eliminates lubrication and re-tensioning to reduce maintenance and labor required on drives. 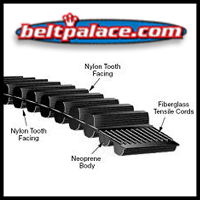 - Gates Twin Power belts have nylon facing on both tooth surfaces providing equal load carrying capabilities on either side of belt. Limited stock remaining: Call for availability (317) 519-9020. Item may qualify for FREE Ground Shipping.